Edible flowers are another great way to increase the beauty and productivity of the planting beds throughout your backyard. A number of plants are grown for their edible flowers, such as nasturtium, violas, and calendula, but did you know that many vegetable and herb flowers are also good to eat? Summer squash blossoms are, of course, the most well known, but here are a few more ideas for how to eat the flowers growing in your garden. Agastache, violas, scented geranium, nasturtium, calendula, lavender, borage, and rose: Use the petals of these edible flowers as cake decoration, ravioli fillings, or sprinkled over salads. Kale, mustard, and collard greens: Add the flower buds to stir-fries or braised greens, or cook by themselves with some olive oil and garlic. Arugula: Arugula flowers have a sweet flavor tinged with the pepper quality of the arugula leaves and make a delicious salad ingredient. Winter squash: The flowers can be used just like summer squash blossoms. More delicate and often not available at grocery stores, winter squash flowers are equally delicious. Herbs such as chive, sage, basil, rosemary, thyme, savory, and so many more: They all have beautiful and tasty flowers that can be used in the kitchen. Bright blue rosemary blooms add a fun , spicy kick to winter salads. Bennett, Leslie and Stefani Bittner. (2013). 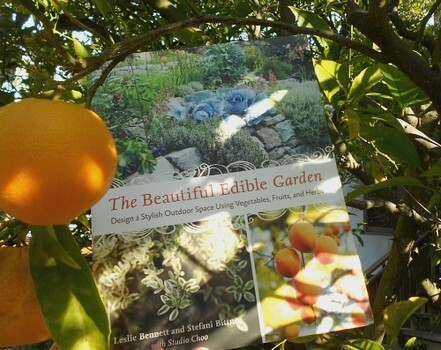 The Beautiful Edible Garden. Berkeley, CA: Ten Speed Press. The last step is to fill in unused spaces with groundcovers and low-growing plants. Repeated throughout the landscape, they are an effective way to establish a balanced and cohesive look in your garden. Rather than ornamentals, use low-growing perennials herbs and edibles as groundcovers throughout your garden. Groundcover chamomile under a fruit tree can be repeated between flagstones in a pathway. If you use a variegated yellow-and-green ornamental grass in one part of t he garden, repeat that same color scheme with a variegated lemon thyme. Remember common sense when harvesting – don’t harvest and eat the ones that are planted in more pedestrian areas like the edges of driveways and sidewalks; instead, leave those to flower and attract pollinators to the garden or use as cut flowers in your home. Now that we have walked you through the design principles of a beautiful garden and the five steps for planning a garden, you are ready to apply these ideas to your front yard, backyard, and other smaller garden spaces. After you have finished placing the permanent elements and anchor plants in your garden, you are ready to choose additional plants that are beautiful and productive. These plants include perennial edibles (like rhubarb, artichoke, asparagus, lemongrass, and berries), annual vegetables (like peppers, eggplants, chard, onions, and celery), herbs, and flowers that you will add to the remaining spaces in your planting beds. Just as your edible plants work for you, pollinator-attracting plants work for your edibles by providing a habitat for the pollinators and beneficial insects that your edible garden needs. Pollination is what happens when pollen is transferred from a plant’s male parts to its female parts. Without it, the development of new seeds and fruits wouldn’t happen. The most effective way for pollen to move around from flower to flower is when it is carried by insects, also called pollinators. Pollinators include bees, butterflies, beetles, ants, and sometimes also birds. Even plants that can rely on the wind to distribute pollen will increase production significantly when they have support from visiting pollinators. A healthy garden also needs a whole host of beneficial insects to help fight off unwanted garden pests. “Beneficial insect” is a general term that includes the above pollinators and also insects that prey on garden pests like aphids or mites. These pest-killers include ladybugs, green lacewings, praying mantis, assassin bugs, and some flies and wasps. Because this range of insects help keep each other’s populations in check, you cannot have a healthy garden ecosystem without them. Happily, the plants that are attractive to your local beneficial insects and help lure them to your garden are also attractive to us – we all like flowers! There are so many pollinator-attracting blooms to choose from, such as yarrow. Yarrow is the real workhorse of the garden. A beautiful, perennial, low-water plant, it is available in a wide range of colors and attracts ladybugs, lacewing bugs, hover flies, bees, and more. In addition to traditional perennial flowers to attract pollinators, you can cultivate herbs throughout the garden and let them flower. Don’t forget to include some of the flowers you really love – even if they are not pollinators’ favorite flowers. Dahlias, hydrangeas, daffodils, and tulips all have a place in your garden if you like them. Mix them in with flowers that pollinators love too for a beautiful, productive, and healthy garden. It’s easy to do regardless of your chosen garden design style, because there are so many flowers to choose from. Along with your permanent hardscaping elements, anchor plantings are the structural framework upon which the rest of your garden is based. These anchors will define your garden through the seasons. Even in winter, when deciduous plants lose their leaves and patio furniture is put away, there should be strong elements in place that provide visual interest and that maintain the basic lines and flow of your garden. Use perennial plants as your anchors. They should be evergreen or, if they are deciduous, they should provide another element like height or strong branch structure. Many fruit trees work well for this purpose. Screening and hedging plants are often used for privacy, but their evergreen foliage can also serve as an anchor in your overall garden design. Once you have arranged the permanent elements of your garden, the next step is to establish your focal points. Focal points are where the eye comes to rest in a garden. They help give a garden direction and energy. You have many options to choose from: a place to sit, a fountain, a piece of garden art, a single special “specimen” plant or tree, a central planting bed – or even a vegetable garden. The key, however, is that your focal point must be something permanent that is special or beautiful. When deciding on your garden’s focal point, think about what you love and then arrange the rest of your design to highlight it. You can do this by making a pathway lead to your focal point, encircling it with low-growing plants, or giving it a background of monochromatic plants so that it stands out. Focal points draw the eye by being a different material, color, or height than their surrounding environment. Focal points should be in proportion to the scale of the garden and reflective of your chosen garden style. The larger your garden, the larger your focal point or points can be. You can also use focal points to enhance the sense of space in your garden. For example, in smaller gardens, a focal point toward the end of the garden’s longest view – rather than right in the center of the garden – will create a more spacious feeling. Whatever you select, a focal point defines the character of the space and gives everything else in the garden a reference point. After you’ve assessed soil, food safety, light, and water conditions, you’re ready to start creating your garden. To achieve a space that is both beautiful and productive, plan your garden layout methodically. This way you can add elements to your garden purposefully and meet your goal of creating a garden that really works for you. The step-by-step process that follows is meant to be an introduction to the planning process; in later chapters, we’ll explain how to apply these steps to specific garden spaces. The location of permanent garden elements such as patios, sitting areas, pathways, fencing, planting beds, and lawns should be decided first. Once you have determined how you want to arrange them, they will be constant, unchanging parts of your garden space and the foundation of your garden’s utility and style. These permanent elements will define the space and how you move around in it. They are also heavy and more expensive than plants, and, if you move them around after plants are already growing in your garden, you’ll risk damaging or killing your plants. For all these reasons, it’s important to place everything in the right spot from the start, so make sure you are pleased with how they fit into and support your overall garden style and food-growing goals before moving on to other steps in your garden design process. These are the garden spaces where your plants will grow. Planting beds are defined and contained by hardscaping materials and pathways. We refer to planting beds as ornamental, mixed ornamental and edible, and annual vegetable, with each describing the type of planting found within the planting bed. If you have the luxury of starting from scratch, the first permanent elements to place are your planting beds. If you are working with an existing layout, make any decisions about adding or modifying planting beds your first step. Patios and pathways define the garden, creating different destinations and leading you to them. If you are starting from scratch, think about how many people may be using the patio and pathways, what purpose they each serve, and what material you’d like to use. A patio can be a communal gathering space or secluded destination. A pathway can take you to a patio, garden bench, or garden gate -or can even just be a circular path with a defined start and finish. Choose one pathway material throughout, then either continue it as a basis for your patio or select a different material that complements the first. This will give your garden an overall cohesive look. Patios and pathways can be made out of a variety of materials, but it is best to use permeable surfaces in the garden so that rain and other water can infiltrate through the surface to the soil below. This way, you can keep water on-site instead of having it run off into storm drains. Your fruit trees and other deep-rooted plants can access this groundwater, reducing your need for irrigation. For these reasons, permeable options such as gravel, decomposed granite, and pavers with unmortared spaces between them are usually better choices than concrete. Use gravel or pavers for main access pathways because they drain more quickly and will not get mucky during winter rains. Groundcover herbs are often grown i the spaces between pathway pavers. Although this looks great and we encourage you to plant them here, it’s best to cook with herbs harvested from your planting beds, which are less likely to be contaminated by foot traffic, and reserve the herbs planted in your pathway for decorative and pollinator-attracting purposes. Johnson’s note: Another great planting option for the spaces between pavers is Stepables, which are perennial plants that tolerate foot traffic. You need a way to get from point A to point B in your garden without tromping all over your freshly turned soil and delicate plants. Ideally, main pathways should be about three feet wide, a comfortable size for a wheelbarrow and strolling side by side with a friend. A secondary pathway through a planting bed can be as simple as a piece of stone or brick to step on. Make secondary paths a minimum of eighteen inches wide. In a perennial planting area, you’ll be using the secondary pathway to pick flowers, fruits, and berries, and also to fertilize and mulch. Annual-vegetable planting beds require more frequent access to harvest, plant, fertilize, and turn your soil. So, while an eighteen-inch pathway is fine between your vegetable beds, you’ll need to have a wider main pathway nearby so that you can use your wheelbarrow to bring fresh compost to your beds a couple times each year. Deciding whether or not to grow a lawn in your garden is an important decision. Lawns take up a lot of sunny space that could otherwise be used for growing food; most traditional lawn grasses are water-thirsty, and many require a lot of fertilizer and herbicide to stay green and lush. There are ways to reconceptualize your lawn as a more productive space. First, consider how large your lawn really needs to be. A straightforward option for gaining more edible space is to simply reduce the size of your lawn. If you expand the planting beds that border it, you can cultivate them with edibles and pollinator-attracting perennials. When growing edibles along-side a lawn area, it is important to switch your lawn care to organic methods so as not to introduce toxic chemicals into the food you will be eating. There are also alternatives to a traditional lawn that still provide an open look and space for family recreation. New “eco” and “no-mow” lawn options require less water, less gas-powered mowing energy, and fewer fertilizers. Or, consider a “lawn” of low-growing herbs, such as Roman chamomile, groundcover yarrow, or thyme. All of these attract pollinators such as bees, so they are not good choices for a recreational lawn, especially if you have young kids running around barefoot. However, if the lawn is more visual impact, these herb alternatives are a great way to achieve an open look while also creating more habitat for beneficial insects and increasing the productivity of your garden.